When the Raspberry-Fig Crostata was originally scheduled I opted for the Johnny Cake Cobbler. It was one of the weeks back in the end of August 2013 when we had the choice between two recipes. 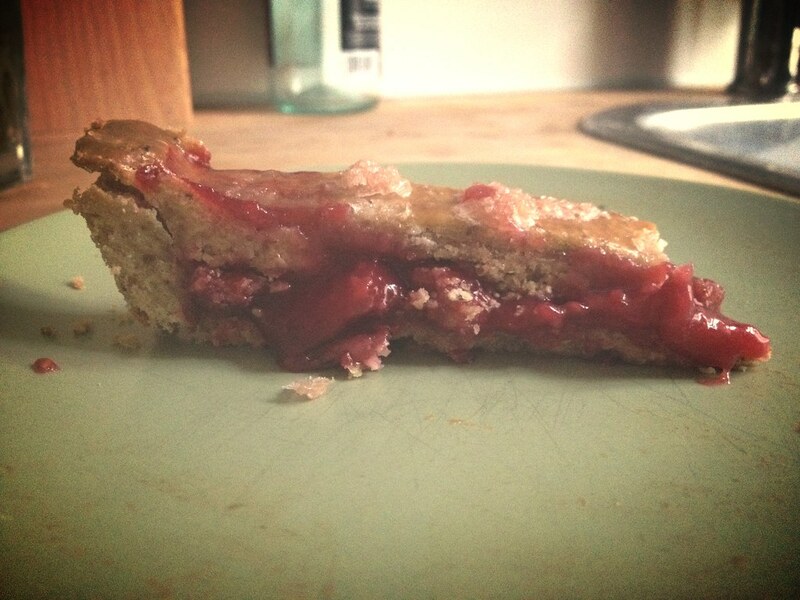 And as raspberries are in season by June/July in Austria and figs never are, I went with the other option. I am not a huge raspberry fan, but many people are so I gave it a try. Instead of figs I used plums which are in season right now in Vienna. The tart dough is an interesting version with almonds and sesame. I like this crust very much and will use it for other tarts, too. But be aware that it is not that easy to handle. I had to press it in the mold but that was fine. When I made the top-lattice I found out it is a bit easier to handle when you flatten it and freeze it. 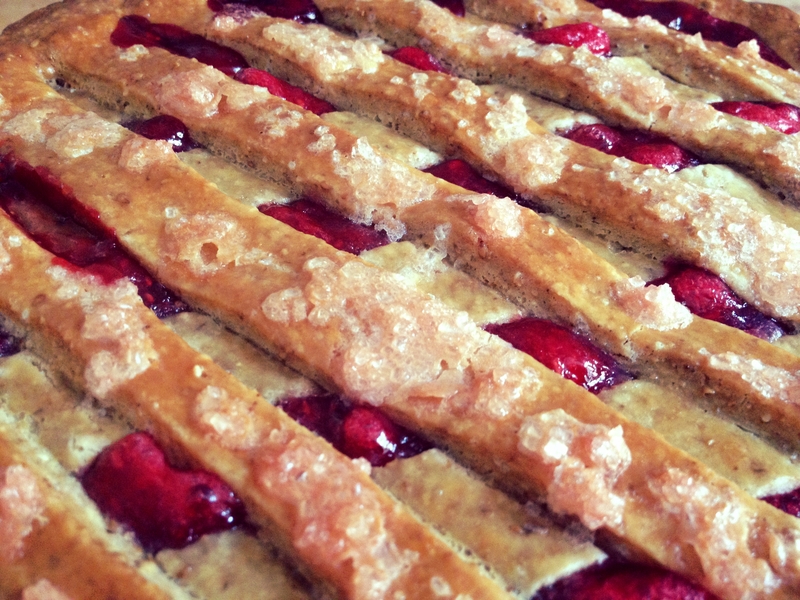 The strips still got slightly too thick, but it was my first lattice, so I am fine with it. The filling turned out good tasting, if you like raspberries. Although I used much more plums than raspberries (I took what I had at hand) the raspberries are very dominant and it was almost not possible to spot the plum-taste. I doubt that it would have been different with figs. The tart looks beautiful and I can imagine it with a whole lot of other fruits. The beauty dissappears when you cut it, at least my tart did not look very pretty cut in pieces, maybe because the filling got too warm at the tart was out of the refrigerator for too long. To find out how it turned out for the other, much more gifted bakers in the group, have a look at the leave-your-link-page for August 20th 2013. And to find out about the recipe, buy the book by Dorie Greenspan and flip to p. 374! I skipped this one originally, too, but I'll probably try it sometime this summer though, because it sounds tasty. I like your use of plums here. Looks good! I loved the dough from this recipe. Definitely a keeper.